In honor of the upcoming National Pisco Sour Day, which falls on the first Saturday of February each year, I was inspired to experiment with the traditional recipe. And like all good controlled experiments, I changed one variable at a time, proportions, citrus, and even the flavor of the simple syrup, then tasted the results. Several cocktails later, I found a spicy winner — the Habanero Pisco Sour. Since hot peppers are at the heart of Peruvian cuisine, and hot peppers with lime are a great combination, it made sense to add some heat to this cool classic cocktail. There are at least 4 ways to add hot peppers to a drink: infused in the spirit, infused in the simple syrup, muddled, or as garnish. I found that the infused simple syrup, was, well, simple to make, and yielded a great flavor profile with consistent results. As for the peppers, habaneros are easy to find in California, and are similar in taste to the Peruvian aji limo, which is used in Ceviche. The first batch of habanero infused simple syrup used only 1 hot pepper, and tasted spicy on it’s own, but less spicy when mixed with the cocktail. So, I made the syrup again with 2 hot peppers and this time, the syrup was extra spicy on its own, and al punto1 when mixed in the cocktail. 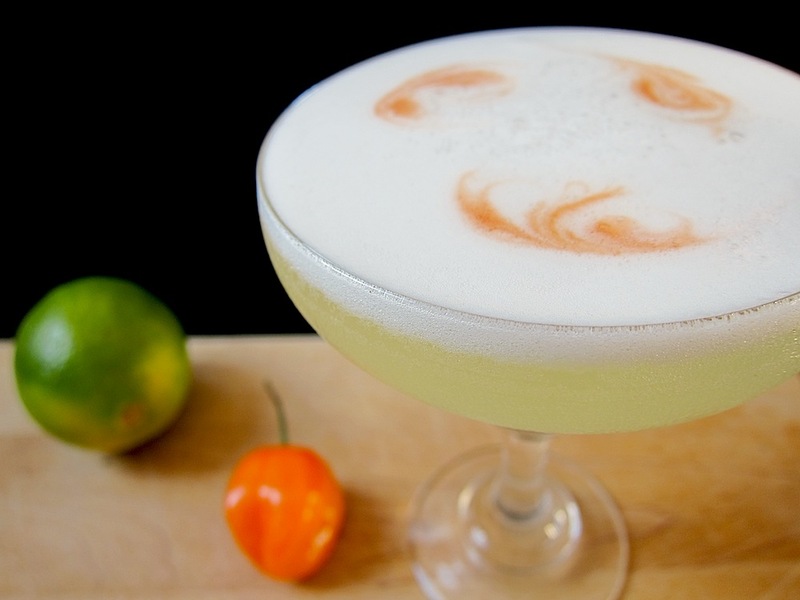 Wishing everyone a spicy National Pisco Sour Day, ¡salud! Mix the Pisco, lime juice, simple syrup, and egg white in a shaker. Add ice and shake for 1 minute to create a thick egg white foam. Serve strained in a coupe, and garnish with 3 drops of Angostura bitters. To make the habanero infused simple syrup, slice 2 habanero peppers in quarters lengthwise, remove the stem, seeds, and veins, then add the quarters to a saucepan with 1 cup sugar and 1 cup water. Bring the mixture to a slow boil, stir, and simmer until the sugar dissolves completely. Strain into a mason jar and let the habanero infused simple syrup cool before using. 1al punto means at the right point, on the mark, or just right.